Kink56 - my experience with Belles has been over the last 6 moths - I had and just sold an original (read no mods or even recaps) early ‘70s pair as my space was not conducive to their use. Were I to have a space just for a listening room, I might have made another choice. I have had a recapped pair of ‘78 Hereseys that have been my main speaker for about 8 years (and am back to using) as the leadup sound to the Belles. The system I use to drive any of my speakers consists of ‘60s era McIntosh tube Pre-amps/amps. The amp that is often associated with bringing out the best in a speaker like the Belle is an MC225. I used one with the Bellles and also an MC240. I enjoyed the sound of my Belles through both amps. I believe mine would have been far better if I had at least done the crossovers. I will say that I found it a challenge to get placement and listening position dialed in. My experience with tubes is has been over many years, but very, very narrow. I don’t know the amp you have coming, but I do believe that if you have an opportunity to hear your Belles with either of the tube ams I mentioned, you will find a very enjoyable speaker. In all honesty, I love my Heresys and given the system I have and the room it is in, I would choose them over Belles. That is not because they sound better per say than the Belles though. From what I have read above, you are doing everything you can to give your pair a fair shake. I don’t know the Forte sound, my speakers prior to the Heresys were KG4s and 2.5s so I can’t speak to the differences to which you refer. 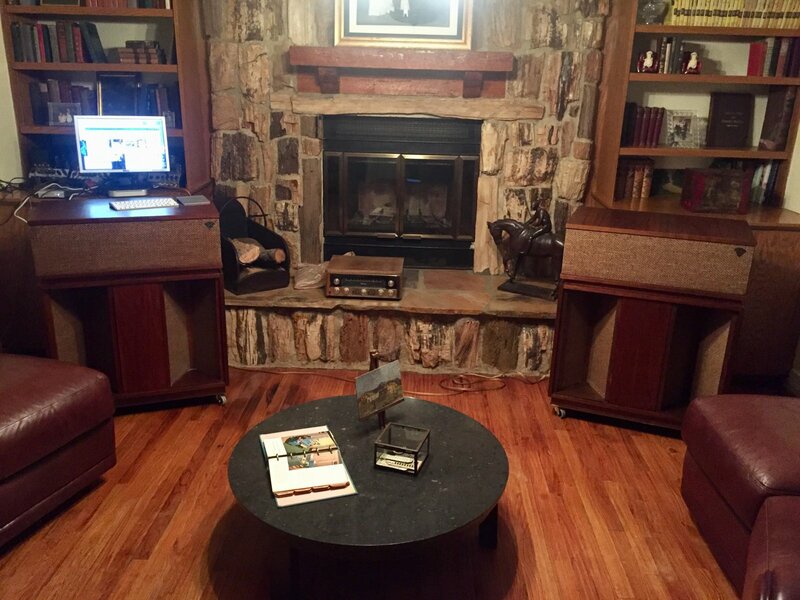 Hopefully someone near you could set you up with a tube amp to give a listen. If ultimately, you don’t like the sound, know that someone will. There always seem to be more Belle buyers than Belles out there - one of the benefits of having a speaker no longer in production. Good luck, I hope you find a sound you like! Post some photos! If you decide to sell them, let me know. I'm just around the corner from ya. Well, I am not sure if you know I paid $5250 for them and that does not include the new drivers I bought! Apparently I cannot upload the second picture even though it is only 1.7MB. A little out of my humble price range. They're beautiful .. Hope you get them sorted out. Yeah, I am stuck with them. They are incredibly beautiful. They don't have all those narrow strips of veneer butted together like most of the originals do. You might consider taking one outdoors to give a listen....do they still give you issues? Have you ever been to a concert in a large venue where they play recorded music as they are setting up? I have always thought that the recored music sounded like crap through those huge speakers they typically use, no matter what concert I have been to. It seems that the more compressed the recording, the worse they sound. Well, compressed recordings typically sound worse on ALL speakers. But with these speakers they remind me of listening to a radio station, or even sometimes music from a TV program! Well I could take them outside, but that requires help. I think I will wait for the tube amp and then the crossovers before I take further steps. Apparently I can load another picture after someone else posts, unless all the pictures I want to load total no more than 2MB; then I could have loaded them all at once. The front panel of this one reminds me of the Mural of the Alien in Prometheus. I took a PS Audio preamp to get serviced today. They had a Dynaco ST-70 refurbished for sale. I will try it out today with my Belles. I am expecting a magic miracle based on how everyone says I need a tube power amp to made the Belles sing rather than ring. I will report back later today or tomorrow. Khorns, La Scala, Belle, Cornwall, Heresy are true "Heritage". Want to "rock out" with Heritage? Get a pair of La Scala or Khorns or maybe Cornwall. Want more laid back sound, but able to crank too? Get Belles. Want great vocals and jazz, get good Heresy. Interesting summation of those speakers. I haven't heard them all, that helps me get an idea generally speaking of which speakers work best with different musical genres. Big horn speakers are better suited for big rooms with some distance for listening but being a horn lover I sit fairly close to my LS's and love the sound. I thought my Khorns sounded pretty good up close as well, although my typical listening distance was about 13 feet. 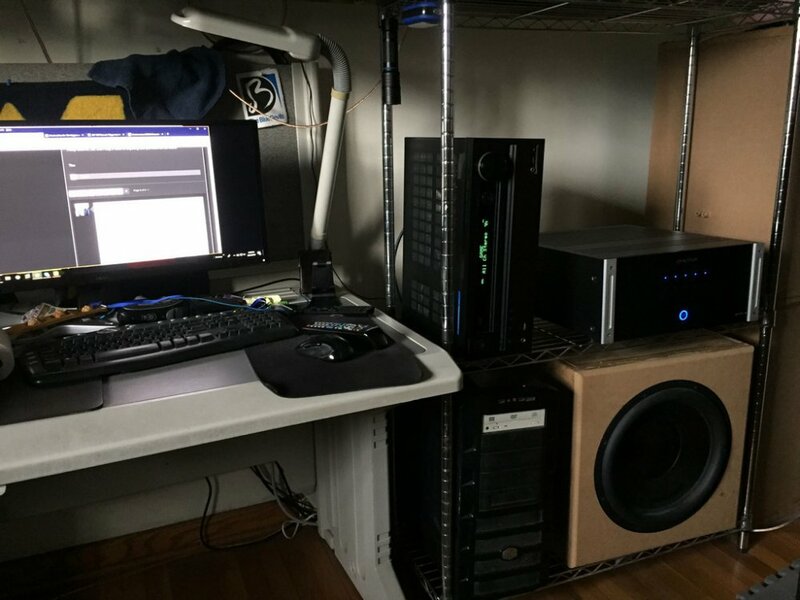 I am also using my CF-4's as near-field computer speakers. I don't need to crank them up very loud and they are crystal clear. 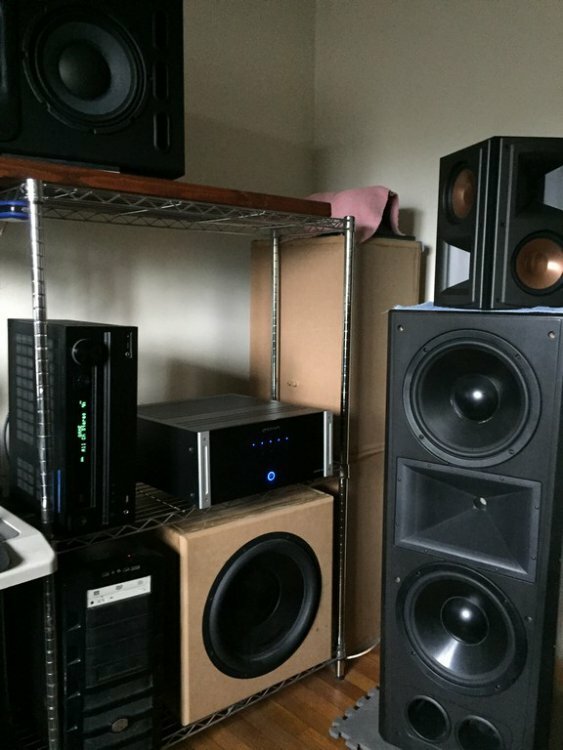 The only speakers active in the 2.1 computer setup are the CF-4's (dual 12" drivers) and the DIY Reference 15 sub w/500 watt plate amp. I've never known an amp alone to transform a speaker from "hate it" to "love it". ..Especially nowadays when audible differences b/w amps are minute if audible at all. I haven't had that experience personally but I have read of others having exactly that. They will hate the speakers, change to a couple of different amps, then all of the sudden the magic appears. I think based on what I've read so far @kink56 has a lot of experience with Klipsch speakers and I trust he knows exactly what's he's hearing. I made the mistake of thinking my Khorn and LS sound was similar to the Belles when someone reminded me the Belle uses a different mid-horn, so it's hard for me to make helpful suggestions, especially when he's doing everything he can to get the Belle's to sound good to his ears. I think you guys with tube amps are going to make more helpful suggestions than anything I can think of. You are expecting way too much. I personally think it's a 'shakes of salt' difference. Meaning, if I make you two hamburgers... I give you the first one however, I have put zero salt on it and you compare it to the second one that has TEN shakes of salt, you will be able to tell the difference every time. Would you however, be able to tell the difference between the two if I put nine shakes on one and ten on the other? The difference might be there but it won't be so dramatic. Were there differences? I'm willing to go alone with there were differences... it's just that (in my experience) those differences were similar to trying to tell the difference between nine verses ten shakes of salt. Perhaps there, but very small differences. I know my stuff sounds different outdoors verses indoors. Well, first impressions are positive with the Dynaco. That resonance is still there, but maybe a little less. But I am getting a nice roundness without loss of detail with the Dynaco. It is a step in the right direction, that is for sure! Can't wait until my Prima Luna ProLogue Five comes early next week! Damn the Dynaco runs HOT. I could use it as a slow cooker for pulled pork! You need another preamp. I’ve never had a positive experience running a solid state preamp with a tube amp (smooth, but flat/dry and two dimensional). You also need better sounding capacitors in your filters. Horns are terrible. The higher the resolving power, the more work it takes to get it right. Also, we use horns to replicate realism of the instruments - we like the dynamics. When you drive past a house with a live band playing music, what is it about the sound that lets you know it’s “live”? It sure isn’t the imaging! Well, to me live = unamplified, acoustic instruments, such as guitar, piano, violin, saxophone, marching band, choirs, vocal soloists, orchestras, jazz combos--NO amps/PAs or microphones involved. 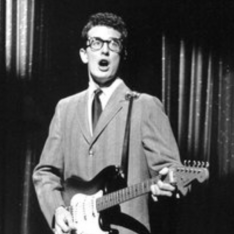 But yes, when a band is playing the a garage it is the dynamics that tells me that it isn't just a real good stereo.